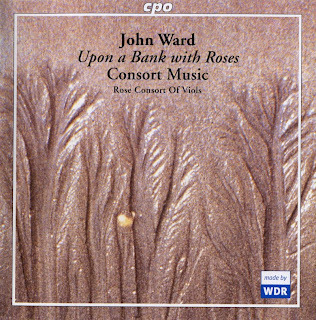 "An extensive and diverse assortment of music for viols by John Ward has survived, and this superb disc presents a selection of his very finest pieces. On offer here are beautifully performed works, ranging from complex six-part fantasias to three part instrumental madrigals and simple two part ayres. Although no information is provided regarding the instruments themselves, all six players bring great warmth to their playing and I failed to discern any weak link among them. The recording quality is also excellent, although the acoustics of Forde Abbey result in a blending together of the instrumental lines in the five and six part pieces where I would prefer a greater degree of separation. As followers of this shadowy figure (there are competing theories regarding his biography) know, Ward’s greatest and most involving works are those written for five and six parts. These appear to have been written later than his vocal music and they show great confidence and stylistic maturity. Not surprisingly then, these works are well represented on this disc. Making use of dissonance, there are some pieces that produce a hypnotic, unsettling effect on the listener (try track 5 Leggiadra sei a 5, and you will hear what I mean). Others, particularly the fantasias, are equally mesmerising, but are played with a lightness of touch that draws the listener into a strange but delightful musical tapestry. Track 15 Fantasia No 6 in C a 4 includes fragments that, oddly enough, immediately reminded me of the later hymn popularised as "The Lord of the Dance", while, perhaps the most sublime work of all Fantasia No 1 in A a 5 (track 13), would not be out of place among J S Bach’s late fugues. The order of pieces is very well done, such that the disc never becomes wearisome (an important achievement, considering that there is relatively little room for textural variability in music written for a consort of viols). Four of the slighter works (tracks 7, 8, 16 & 17), include an organ part, ably played by John Bryan. 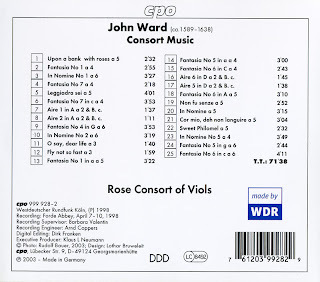 Critics of Ward’s compositions point to a certain lack of rhythmic invention, and a mechanical application of musical formulae which impacts upon their overall quality. Yet, on this disc, all I hear are beautiful, engaging and impressive works that I class alongside the best of Byrd and Gibbons. Full credit must go to the players who never fail to bring out all the rich sonority of this wonderful music. A must buy for all lovers of early seventeenth century music for strings." Ah, another poorly known English consort musican.. I'm trying to download this one, but I'm encountering problems. When I tried 2 of the MediaFire downloads, both downloaded but the decompression utility I'm using (7-zip) says both files are broken. I then tried the first Rapidshare download, and my decompressor works up to 23% and then says the .ape file is broken. It 'may' be that my utility is the problem, but it works with all other .rar files I download generally. I just thought I'd mention it, to see if the problem is at my end or with the uploads. Thanks for reporting, Alex. I don't know what the problem might be. I've downloaded again from MediaFire (most prone to cause file problems, in my experience), but decompression with Zipeg (Mac) or Winrar and 7-zip (Windows) showed no errors. But as a firm believer in Murphy's Law, that's not saying anything.